Welcome back! I really hope you're enjoying getting to know all the designers so far in this series. If you haven't taken our poll yet, click here to read the info and let us know what you think. 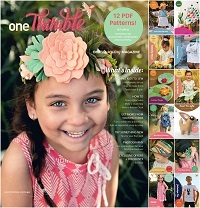 Today's featured designer is Samantha of Mrs. H Sewing Patterns. I was first introduced to Samantha's patterns when I joined the Bag of The Month Club and made her Companion Carpet Bag. She just finished up what sounded like an amazing sewing retreat this Spring, and is gearing up for another one in South Wales (UK) in October; limited number of tickets are still available. I learnt to sew at school and did GCSE textiles, but then I didn’t even think about sewing again until around 2010 when I started dabbling. We were on a tight budget and buying patterns wasn’t particularly high on our list of priorities so I decided to just make my own. I realised that I have a very peculiar brain and I can see a 3D bag laid out in the 2D components in my mind, and often can develop a new construction technique just by pondering it for a while. My Nappy Bag gusset method took around a month of pondering, trying, pondering, trying, and finally succeeding! I love having the freedom to create whatever I can dream….pretty much anyway! I love the start of the process, I get a quickening in my soul when I pull out a fresh sheet of paper and start the initial drawings on my muslin. I love the end of the process when I get to submit the pattern to the world and see what the bagineers can do with the pattern. Seeing their amazing creations is the most rewarding part of the process. I find that I spend a lot of time on research. I would never want to copy someone else’s design, even by accident, so I spend a lot of time trawling the web to make sure it’s unique, and if I find something similar then I work to change it where I can. I’d say that’s my biggest fear in this business, to not be unique. Designing a new technique or shape or construction method is so challenging, and I have a lot of respect for the effort other designers have put into also making their patterns unique. I’m learning to play the piano so that I can play at the local care homes at Christmas time. That’s the excuse I tell everyone else, at least, but the real reason is that I love having a pretty grey piano in my house! My second favourite hobby is eating. I like to eat a lot. Green peppers and pineapple. Just like me, super sweet with a bit of a bitter side! The excitement of starting to see a creation come together and the sense of pride that no one else will ever have the same bag, even if they use the same fabrics, because we’re all different! Sewing long straps. I get bored easily and usually my mind wanders about halfway down. Then I have to do them again. Lots of bagineers have suggested I sew the straps first, so I’m trying that in an attempt to not have 20 strapless bags hanging around! My favourite is usually the next bag I’m working on, so I can’t tell you what it is at the moment...but my previous favourite was the Captivating Clutch. It’s just so clever how it comes together, and it’s surprisingly spacious inside! I tend to measure the time taken to sew a pattern in Toblerones. A few chunks for a quickie, multiple for a long one. Chris W’s Penny Inn took me a whole Toblerone to make! My favourite is currently the Snappy Edge clasp from Emmaline Bags, it’s so shiny! It’s like a regular snap, but made fancy! My preferred colour at the moment is the Copper version, I’m starting a petition to have all hardware available in Copper! I’ve got a Janome 6600P which I love with all my heart. It’s a semi-industrial machine, I believe it was developed with quilters in mind, but it can handle everything I’ve thrown at it so far and I love the features it has. Find yourself a great bag making group on Facebook where you’ll get all the support you need. 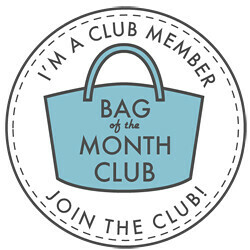 You need a team when you’re starting out, but fortunately team members are easy to find in groups such as Sewing Bags & Accessories (https://www.facebook.com/groups/sewingbags/), British Bag Makers (sorry, it’s Brits only!) (https://www.facebook.com/groups/britishbagmakers/) , or other similar Facebook groups. The people in these groups can also help you find yourself a designer who’s willing to help and advise, and who’s able to help you adapt a pattern to your own needs if necessary. It’s very easy for new bag makers to be overwhelmed with the range of interfacing, stabilisers and hardware, let alone finding the right designer with enough time and experience to explain a technique sufficiently. Secondly, find yourself a good source for tutorials and techniques. Most designers have a free pattern or two on their site so that you can have a go without too much outlay on the pattern at least. Use these as a way of learning the skills of bag making, and also to see how the designer’s writing style suits you. If you absolutely hate reading their pattern then they’re not the designer for you. If you can follow the pattern fairly well and it has a good explanation to back up the great design then add them to your list of designers to buy from. I have ginormously big heart eyes for Bari J who designs for Art Gallery Fabrics. Alas, the new ranges take so long to arrive in the UK that they’ve usually sold out by the time they get here. I love her style, I love her colours, I love her skill. I love her so much I keep trying to get her to adopt me, but I don’t think she fancies having a 34-year-old daughter. In the past, I’ve been a very messy maker, and verging on the hoarder side of crafting. I’m sure you all identify with the ‘just in case’ philosophy? Well I did the 30-day Minimalism Challenge with some friends of mine and really took a step back to look at the beautiful studio that we’re blessed to have. I was ashamed of how I was abusing this space. I’d feel annoyed every time I came in, I was unproductive, I had PhDs (Project Half Done) staring at me all day long and I just felt kinda down about it. I went through every area of the studio and was absolutely ruthless about getting rid of anything I couldn’t see myself using in the next 12 months. I got rid of PhDs that I was never going to finish, piles of fabric I bought for a particular project were put back into the stash shelves, and I released so much space and freedom into my work environment. It really was surprisingly easy once I’d embraced the philosophy that holding onto some things is purely fear of the future. It’s so quick to tidy up the studio now at the end of the day and so much easier to work in. It takes me around 8 minutes to do a full studio clear down at the end of the day, although if I’m mid-project I pile it all on the cutting table and clear around it. I made a really good effort to finish everything on my WIP (Works In Progress) pile and I did so just last month. I felt amazing! I still have a stash, it’s just more refined and curated. I don’t have the fabric hanging around that, if someone were to come and visit, I’d be a bit embarrassed of having. I don’t have tubs and tubs of buttons, just one small spice jar of each colour. I have more than enough and I’m appreciating what I do have. I’ve chosen fabric in record time the last two bags, that can’t be a coincidence, right? Grey, hands down, every time. It’s not even a colour!!! I got to a point in my life where I just had to admit that grey was my favourite colour. I looked around and everything was grey. Grey car, grey living room, grey bedroom, grey carpet, grey sofa, grey curtains, grey clothes… you get the picture. It depends on what I’m doing. If I’m writing then I listen to music without words, otherwise I find myself typing the lyrics! If I’m designing or sewing something to a deadline then I listen to running playlists on YouTube, they’re motivational and I feel good like I’ve done a workout or something. Especially if it’s a “whole Toblerone” type of pattern. If I’m innovating and working on new techniques then I listen to worship music as it’s calmer and less fast paced. Too much excitement in new techniques even without the wild music too! Sometimes I wish that people truly knew the time and work that goes into an innovative pattern. It’s not quick to write up any pattern, but it’s a whole lot quicker to write a pattern for a style or shape that’s already popular with just a small twist, such as my Fiesta Tote. But then adding to that pattern writing the designing, making muslins, developing methods on how to do X without having to do X, starting over because it didn’t work out after all, it can make for a very long process with a lot of brain burn. Once I’m at the end of a pattern and it’s out in the world I consider it gone. The ways that bagineers develop a pattern with their own spin on it always amazes me. I’ve seen versions of my patterns that make me breathless because the bagineer has taken it to somewhere I never would have gotten to. My patterns are a spring board, the bagineers are the talented ones to take the pattern as a template and take it that much further. How do you make sure that your patterns are accessible to bagineers? It’s hard for bagineers to know which patterns to buy. Unfortunately, it’s not always as simple as just choosing a design you like. 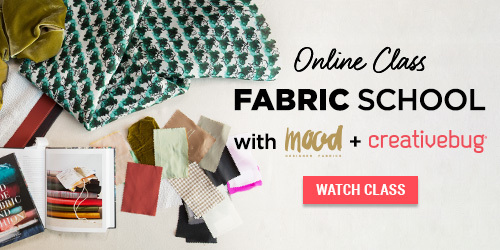 You don’t know if the pattern will be clear, well written, with easy to sew methods. I’ve got a couple of free patterns on my site and a plethora of tutorials so that bagineers can see if my style of writing suits them. I hold a live Q&A session every few months where people can ask me specific questions of things they’re struggling with, or bag making techniques they need a little extra help with. It’s part and parcel of being a designer, that you know your craft well enough to be able to explain and teach techniques that might be a bit beyond the basic bag designs. In fact, I found myself working out the maths of someone else’s pattern last week when it printed out at the wrong size, for a member of one of the bag groups I’m in. I really enjoy trying to find alternative methods to existing techniques to make things easier and more accessible to bagineers. Things such as developing my zipped gusset method so that you don’t have to do seam binding or a drop-in lining, or for example using a traditional waistband method for sewing fully enclosed straps. ​I try to be as helpful as possible in bag making groups on Facebook when people are struggling with my or other people’s patterns. As well as letting me be helpful, it gives me a chance to let my experience and knowledge shine through. I see many people joining my Facebook group who have encountered me initially through troubleshooting and explanations I’ve provided in other groups. I share my patterns on Instagram and Facebook, and love to share what people have made with my patterns – it’s so inspiring to me! I really value the free patterns I’ve created, alongside plenty of tips and tutorials on my website and social media feeds, as a way of introducing people to my work. People can see that I know what I’m talking about….mostly!